A Western Pacific freight train heads west past the Tracy depot. The bikes leaning against the depot wall belong to station agent Godwin’s kids. We came to Carbona in 1954 from Wells, Nevada (Population: 500). We moved there via the California Zephyr. The prior agent was single so the place was a mess when we arrived. We stayed at the Mission Motel in Tracy for almost three weeks while my parents got the depot livable. My parents loved California. No snow, and things grew there. My Dad even watered the weeds just to watch them grow. It was pretty neat living in a train depot. My grandfather lived in the Southern Pacific depot in Fallon, Nevada, so being in depots just seemed natural to us. When we were kids and the trains would come to switch out the gravel pits, we would get to ride in the engine and ring the bell and blow the horn. We all learned to drive by sitting on my Dad’s lap and steering while he wrote down the numbers on the cars. My Dad was a telegrapher/agent. He would transcribe incoming telegraphs, type them up and then attach them to the hoops, and then he would stand out as the train went by and one went to the engine and one to the caboose. As you can see there are two different kinds here. The first (with loop) had the disadvantage of going with the train. With the second one (Y-shaped) just the message and string went and the loop stayed with the depot. This was before radios, etc. He would also send outgoing messages via the telegraph. As I stated above, his father lived in the Southern Pacific Depot in Fallon; his cousin was the agent for Southern Pacific at Hazen, Nevada. They lived in a railroad house across from the depot, and his brother worked for the Southern Pacific as Crew Dispatcher. 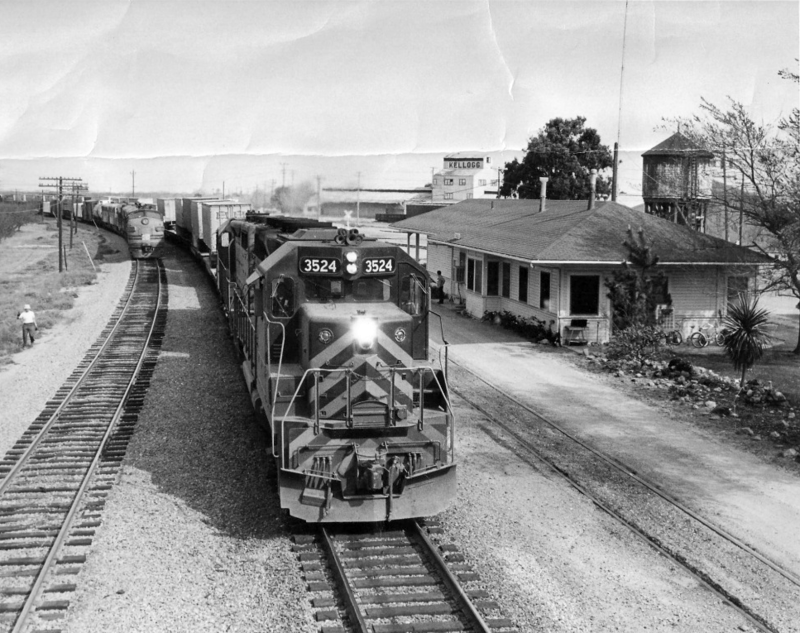 When people would come to our home and a train would go by, they would panic because it shook the depot — some went by at 70 MPH just a few feet from our living room, and then we had tracks that ran right in front of our house where they would set out cars at some times. 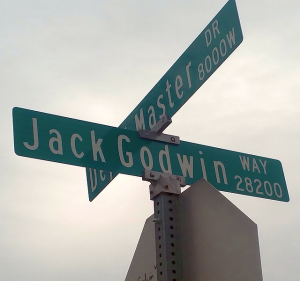 Jack Godwin Way street sign, at the corner of Depot Master Drive in Tracy, near the old Carbona station. 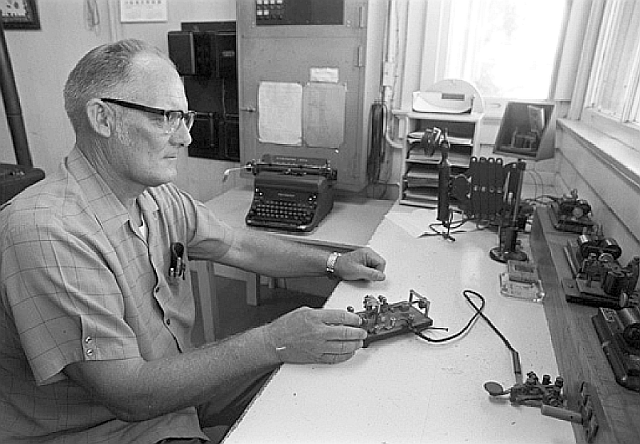 Jack Godwin had begun working for the WP in June 1942, assigned initially to their Elburz, Nevada, outpost and later to other stations along the way in rural Nevada and Utah. He was felled by a heart attack in 1974 that took his life at only 51 years of age, having worked on the railroad for 32 of those years. The Western Pacific’s old Carbona/Tracy depot survived another decade before it, too, was felled. These days, nearby in the Linne Estates housing subdivision just off the tracks east of the Carbona Curve, you’ll find Jack Godwin Way and Jack Godwin Court. They’re located off Depot Master Drive, a block down from Zephyr Drive. Not coincidentally, the railroading that was in Jack’s blood was passed down to yet another generation, as two of his sons, Dave and Mike, continued their family’s heritage by also working, respectively, for the Southern Pacific and Western Pacific.